It can be right, if I name my bedroom as Alpha, my bathroom as Delta, and my dinning room as Zeta. And, yes I know, it lacks some standardization… If tell you “my home has three Alpha, two Delta and one beautiful Zeta” , how does it sound? Basically, we use a <div> element as a container and then we give a meaningful class name for it. Does it work? Sure, it does. And the funny fact is that we use to give common names to some specific <div> elements. According to a research conduct by Google (https://developers.google.com/webmasters/state-of-the-web/2005/classes) we have popular class names like: footer, header, nav, and article. 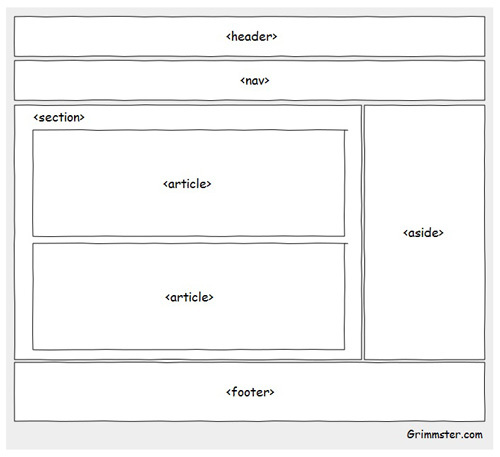 It’s used for grouping things, for example a group of <article> elements. Basically the <section> element is used in the same way we use the <div> tag now, but with semantic meaning. It’s used typically at the bottom of the page and should contain information about the section it belongs to. For example, on a web site it can hold information about the website, author, copyright, terms and conditions. Used with an <article> it can have date, author, tags and categories. Through meaning we expect some context. That I’m finishing my article and gonna search for food.. Web developer, interested in e-commerce, interfaces, HTML5 and sushi bolognese , I mean, spaghetti bolognese.